Tomorrow is the 40th Anniversary of Star Wars. And what better way to celebrate than to see Twins Luke and Leia reunite on the set of Star Wars: The Last Jedi. 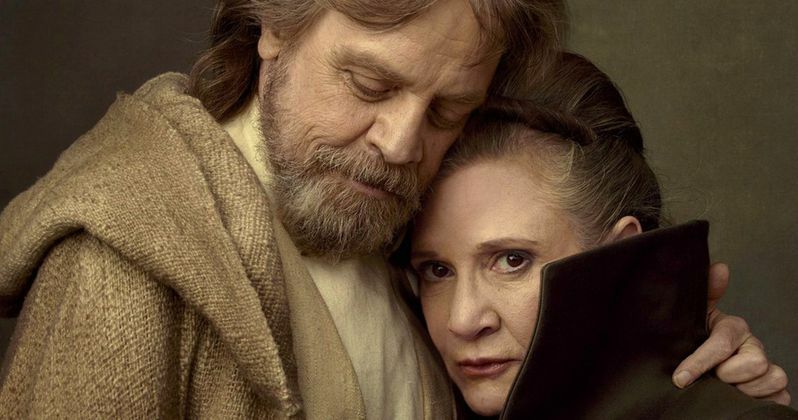 Vanity Fair has unleashed their massive Star Wars 8 preview, and with it comes a first look at Carrie Fisher and Mark Hamill together one last time in a beautiful new portrait by Annie Leibovitz. Carrie Fisher sadly passed away last December shortly after finishing all of her scenes from The Last Jedi. And this special Vanity Fair shoot came in the midst of production. So we get to see Luke and Leia interacting on set here for the first time. It is widely known that one of the key scenes in the movie has Luke and Leia finally reuniting after more than thirty years in space. Now, we get to see what that looks like. The issue offers some new insight into the making of the movie. Perhaps most notable is that the end of The Force Awakens and the beginning of The Last Jedi were not shot back-to-back as previously thought. Director Rian Johnson had to painstakingly recreate the final moments of Star Wars 7 atop the cliffs of Skellig Michael more than a year later. About those scenes, Mark Hamill reveals this. "When I read the script for Episode VIII, I went, 'Oh my God, we're going back?' Because I said I was never going back." Hamill is partially joking. Back when The Force Awakens was shot, stories circulated that Mark Hamill had almost slipped to his death while traversing the slippery steps of this Irish Isle. So you can see how he might have been apprehensive about returning. As for Carrie Fisher, she logs significantly more screen time in The Last Jedi, playing General Leia Organa. Oscar Isacc shares a lot of those scenes with Fisher. And says that she gave a very 'rich performance'. She gave her all, rather than treating it like an 'exercise in feel-good sentimentalism'. Isaac goes onto say this. "We did this scene where Carrie has to slap me. I think we did 27 takes in all, and Carrie leaned into it every time, man. She loved hitting me. Rian found such a wonderful way of working with her, and I think she really relished it." Director Rian Johnson also spoke of his deep bond with the actress. They spent a lot of time at the compound where Fisher lived with her mother, the late Debbie Reynolds. Says Johnson. "After I had a draft, I would sit down with her when I was working on re-writing. Sitting with her on her bed, in her insane bedroom with all this crazy modern art around us, TCM on the TV, a constant stream of Coca-Cola, and Gary the dog slobbering at her feet. Out of everyone, Carrie was the one I really became friends with and expected to have in my life for years and years. I last saw her in November, at the birthday party that she threw at her house. In a way, it was the perfect final, encapsulating image of Carrie-receiving all her friends in the bedroom, with Debbie holding court in the living room." About Carrie Fisher's final performance in a movie, Lucasfilm boss Kathleen Kennedy says this. "She was having a blast. The minute she finished, she grabbed me and said, 'I'd better be at the forefront of IX!' Because Harrison was front and center on VII, and Mark is front and center on VIII. She thought IX would be her movie. And it would have been." Mark Hamill also spoke about the untimely passing of his former co-star, who was like a sister to the actor. "I can't say that phrase, what you just said: Carrie's name and then the d-word. Because I think of her in the present tense. Maybe it's a form of denial, but she's so vibrant in my mind, and so vital a part of the family, that I can't imagine it without her. It's just so untimely, and I'm so angry. We got to talking about one of our favorite scenes in The Adventures of Tom Sawyer, which is when Tom and Huck go to their own funeral, and they're up in the balcony, hearing their own eulogies. So then I said, 'Look, if I go first, just promise me you'll heckle my funeral.' And she went, 'Absolutely, if you'll do the same for me.'" Carrie Fisher's death has not changed one scene in The Last Jedi. It will land in theaters as intended, with no new scenes to address her death. They did, however, have to rework Star Wars 9, which is scheduled to shoot in January. The team will not be reanimating Fisher's Leia via CG or motion capture. Here's a look at Luke and Leia together again for the final time.